BATANGAS - Barangay Ginebra looked like it didn't know what hit them, so much so that the Gin Kings took a timeout beyond their limit in the endgame -- that resulted in a technical foul -- just to figure out what to do. A rejuvenated TNT Katropa left the Gin Kings flustered as they found a way to negate their opponents’ size advantage to score a 103-96 victory on Wednesday night and tie their PBA Governors' Cup semifinal series at one game apiece. 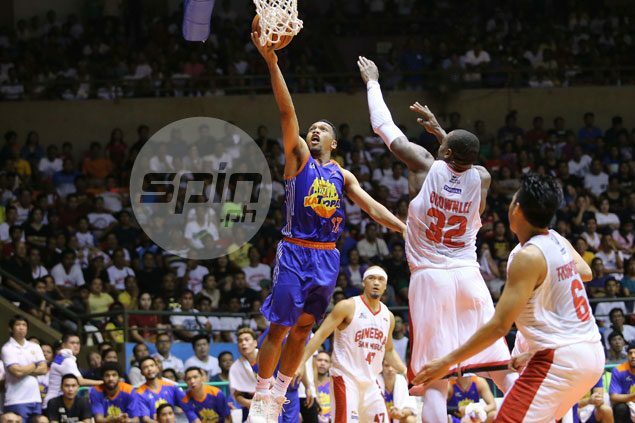 Glen Rice Jr. sparked the Texters' hot start, before Jayson Castro led the local crew in taking over while the TNT import was hobbled by foul trouble in the third quarter as they overcame adversity in what felt like enemy territory at the jampacked Batangas City Coliseum. The Texters can take the lead in the best-of-five series that shifts to Game Three on Friday night at the Smart-Araneta Coliseum. Rice put up a solid start and an even better finish when he was on the floor, firing a team-high 21 points in less than 23 minutes – scoring eight in the first quarter and 12 in the payoff period to keep the Texters on the driver’s seat most of the game. Castro added 20 points, spiked by three triples, 10 assists, four boards, and one steal in almost 36 minutes, scoring 11 of his output in the third quarter to keep the Gin Kings at bay despite Rice sitting the entire quarter. Troy Rosario provided the contribution that was lacking in the series opener as he chipped in 16 points, eight rebounds, and two steals, while Roger Pogoy, and Mo Tatuaa also scored in double figures. Kelly Williams continued the hold the fort down low, adding seven points, 11 boards, and three assists – one on o no-look feed to Danny Seigle late in the third quarter. The Gin Kings erased an early 18-point deficit and took the lead momentarily at 51-50 early in the third quarter, but failed to sustain their run down the stretch as the result spoiled the homecoming of Nasugbu native LA Tenorio.